Bon Odori, or Bon dance, is a kind of dance performed during the summer Obon season in Japan, when it's believed that people's ancestors return to visit the world of the living. Rather than somber affairs, however, Japan's Three Great Bon Odori Dance Festivals represent an energetic mix of traditional choreography with modern-day merrymaking. This Bon dance takes place in the town of Ugo, which was formed by combining the former town of Nishimonai with six surrounding villages in the south of Akita Prefecture. The Nishimonai Bon Odori is composed of just two different dances performed by local residents to the accompaniment of taiko drums, shamisen and wooden flutes (yokobue). The dancers are distinguished by their patchwork kimono, called hanui, which are worn with large, semicircular straw hats called amigasa. Some dancers wear hikosa zukin, black hoods that recall the dead. Recognized as a National Important Intangible Folk Cultural Property, the dance traces its origins back more than 700 years to a harvest festival initiated around the late 1280s. Following centuries of Onodera rule, in 1601, Onodera Shigemichi set fire to Nishimonai Castle rather than surrender to forces allied with Tokugawa Ieyasu, who was in the final stages of unifying all of Japan under what would become the Tokugawa Shogunate. Beginning that year, his surviving retainers would dance in memory of their former lord. Over time, the two dances merged, becoming the Nishimonai Bon Odori we see today. It takes place from August 16 to 18 every year, with the 18th representing the big finale. This festival in Gifu Prefecture dates back over 400 years and stretches over 32 nights from July to September. Gujo Odori actually consists of 10 different types of dance, and the festival tours all over the town of Gujo Hachiman, moving from the castle town to city squares, shrines and more. The festival reaches its peak between August 13 and 16, with a host of all-night dance parties that run from 8 p.m. until the wee hours of the morning. It's said that Gujo Odori originated as a way to create bonds between the different social classes at the end of the Warring States Period (1467-1590), including warriors, traders and craftsmen. Today all are welcome to participate in the event—tourists and locals alike! “It’s a fool who dances and a fool who watches. The festival got its start in 1587 (some sources say 1586) to celebrate the construction of Tokushima Castle in what was then known as Awa Province. Feudal lord Hachisuka Iemasa distributed sake to the townspeople, who got drunk and began to dance in the streets. And that, as they say, is history. By day, dancers perform the carefully choreographed "Selected Awa Dance" on stages. When the sun goes down, however, groups of dancers, called ren, perform through the streets of downtown Tokushima, including groups from all over Japan and even overseas. You can catch the festivities from August 12 to 15 each year. While not a form of Bon-odori, the Yamagata Hanagasa Festival, or Hanagasa Matsuri, is one of Tohoku's largest festivals, drawing crowds of over 1 million over the course of three days. This dance fest is fairly new as far as Japanese festivals go, getting its start in 1964, but has quickly become an important annual tradition. 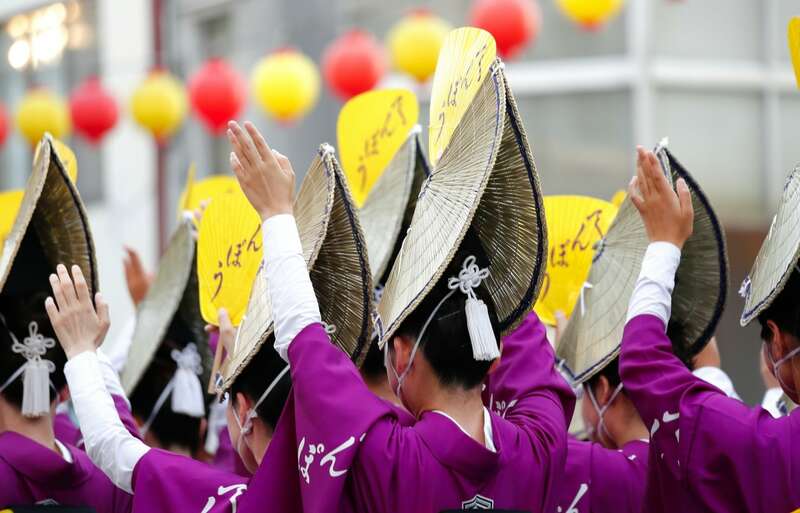 The festival is named for the straw hats worn by its dancers, decorated with Yamagata Prefecture's signature safflowers. A total of 10,000 dancers flow through Yamagata City's main street, led by a fleet of elaborate floats. Hanagasa-daiko drums provide an upbeat rhythm as both dancers and onlookers shout, "Yassho! Makkasho!" While the festival originally featured technical group dance performances, the celebration now features a wider variety of dance. The Yamagata Hangasa Festival takes place from August 5 to 7 in Yamagata City proper.